The land on which the house known as Brandon Hall now stands first passed into private ownership as a royal grant from the Spanish King Carlos III to one Frederick Calvit, an American, in the year 1788. The grant of 798 American acres came through the offices of Don Estevan Miro, governor of the Spanish province of Louisiana. Apparently Frederick Calvit died before developing the property and his executors sold it to one John Roberts who also died shortly after he acquired it. In 1809 the executor of Roberts sold the land to William Lock Chew at public auction for the sum of $7,000. It appears that Chew constructed the first permanent dwelling on the land consisting of a three room brick house, about 20 ft. by 60 ft. built sometime between 1809 and 1820. This structure still exists as the basement of the present house known as Brandon Hall. A daughter of William and Rebecca Chew married one Spence Grayson and bore him a daughter, Rebecca Chew Grayson, who died in 1833 at the age of two and is buried together with her uncle, Thomas Grayson, in a tomb not more than a hundred yards from Brandon Hall. In 1833, Chew sold the property to Nathaniel Hoggatt a successful planter and the owner of a large adjoining tract. Hoggatt’s daughter, Charlotte, was married on October 29, 1840 to Gerard Brandon III, the son of an early governor of Mississippi and the grandson of a Revolutionary War hero of the same name who, during his lifetime, had resided at Selma plantation only a short distance from the Chew property. After their marriage Gerard and Charlotte apparently lived in the house built by William Chew and when Hoggatt died late in 1853 they inherited the property and began construction of Brandon Hall, completing the house in 1856. As part of their construction plan, the Brandon’s decided to elevate the house about four feet above the surrounding ground, a tremendous project at the time, requiring the moving of some 6,000 cubic yards of earth which practically engulfed the original Chew house and made it into a basement with the necessity for a retaining wall on the southside that created the corridor now a feature of the kitchen-pantry complex. Gerard and Charlotte Brandon had twelve children, seven of whom died before the age of 18 and are buried in a small cemetery only a stone’s throw from Brandon Hall. 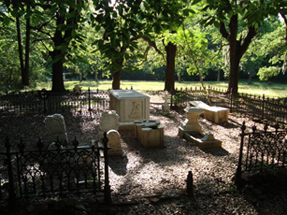 Gerard Brandon III died in 1874 and Charlotte in 1878 leaving Brandon Hall and the surrounding plantation (now some 2,200 acres) to their surviving five children. Elizabeth Brandon the eldest survivor became the mistress of Brandon Hall, gradually acquiring the interests of her four brothers and sisters, and lived there with her husband Aaron Stanton until her death in 1900 when the property passed by succession to Stanton and her three children in equal shares. One of these children Charlotte (Merrill) followed the footsteps of her mother Elizabeth and gradually acquired the interests of her father and her siblings, completing the acquisition in January 1913. Unfortunately Charlotte Brandon Stanton Merrill had little time to enjoy her undivided ownership of Brandon Hall because on January 27, 1914 the plantation, house and land, was sold at auction to one George Hightower as a result of default on promissory notes held by the First Natchez Bank. Thus ended an 81 year chain of ownership by the Brandon and Hoggatt families which extended from Mississippi’s frontier days through the Civil War and finally ending shortly before the first of two World Wars. From 1914 until 1983, Brandon Hall Plantation passed through 9 other owners, its acreage slowly depleted by successive sales until only the house and 40 acres remained intact. When the property was acquired by the Defenthals in 1983 its condition was seriously deteriorated and it was obvious that major restoration was required if it was to be saved for the future. A team of architects began work on plans and specifications for the restoration and in May 1984 local contractors started work on the foundations and continued until September 1987 when the house and outbuildings were essentially complete. Some of the major items of restoration accomplished were: the replacement of brick foundation piers where old mortar had crumbled; the replacement of a majority of the 14” x 14” sills which were rotted or termite damaged; the reconstruction of the entire galleries surrounding the house and the enclosure of the rear gallery for additional living space; the renewal of every column and the replacement of several cast-iron capitals that were missing; the renewal of reinforcement of a majority of floor joists and studs where the originals were rotted or insect infected; the installation of all new plaster, inside and out, to replace the original that was cracked and water damaged; the replacement of roof supports that had rotted or cracked; the installation of a new copper roof over the house and galleries; the removal and repair of every door lock and the restoration of all broken hardware such as hinges and latches of which was specifically cast to match the originals the leveling of all floors; the reconstruction of all the masonry stairs at the front and side entrances; the removal of old and the application of new paint throughout and the repainting and rebricking of each fireplace and chimney with the installation of all new dampers and new chimney pots as required. In addition to the above items of restoration which perfectly duplicated the original construction new construction and additions accomplished were: the installation of a new electric service and the complete wiring of the house according the modern standards; the construction of a kitchen, pantry, guest bathroom and bath in the basement area which itself was completely refloored; the construction of a bath, powder room, bar and warming kitchen on the previously open rear gallery; the installation of five 5 ton heat pumps for air conditioning and central heating; the installation of five new bathrooms to serve the upstairs bedrooms; the installation of a complete new plumbing system utilizing copper pressure pipe and cast iron drainpipe; the installation of a passenger elevator to serve three floors and a dumb-waiter from the basement to the warming kitchen adjacent to the dining room; the addition of numerous closets on all floors and in the newly finished attic; the construction of two identical cottages for the caretaker and other employees and the construction of a garage and workshop. Other new works are the terraced gardens and walked at the rear entrance, the landscaping around the entire house and the enlarging and deepening of the pond in the front of the house.